*It has been a long time since I slept through getting up to walk with Nikki in the mornings. Well, I accomplished that today. It was 5:10...the alarm went off...I was going to close my eyes for about 10 minutes or so...and before I knew it, I was looking at the clock and it was after 6 a.m. Darn! *And then I just kind of felt behind all morning. I was few minutes late for my 8 a.m. hair appointment uptown, but it was all good. It felt good to get my hair cut and some new color in it!! *Once that appointment was done, I stopped at home to let Sadie out, then got back in the car and drove to Coeur d’Alene. My first stop was the PERSI office to drop off my retirement paperwork. I wanted to do it in person to make sure everything was in order. And I was glad I had them look it over, because there was one item I only checked on the line, instead of checking the box and initialing the line. If it would have been submitted that way, the paperwork would have been returned to me. So it was worth the stop!! *Then it was off to Kootenai Medical Center to pick up Christy from her knee replacement surgery. It went really well, and Christy was happy with how things went. She was wheeled down to the main floor, I brought the car up, and we stopped at Starbucks for a couple of Breves, and then we headed for home. She did a great job getting out of the car, and walking down the sidewalk, and up the stairs into her house. She was alert all afternoon, as we talked, and watched an episode of The Boise Boys, a home improvement show on HGTV, and as she had her two dogs come in to say hello. I went outside to look at her backyard, and the spirit of our mother overcame, and I deadheaded her flowers around her garden. She had just done it on Sunday, but those petunias need a lot of care. Tomorrow I am heading back in the afternoon to spend more time with her. So far, it is going great. 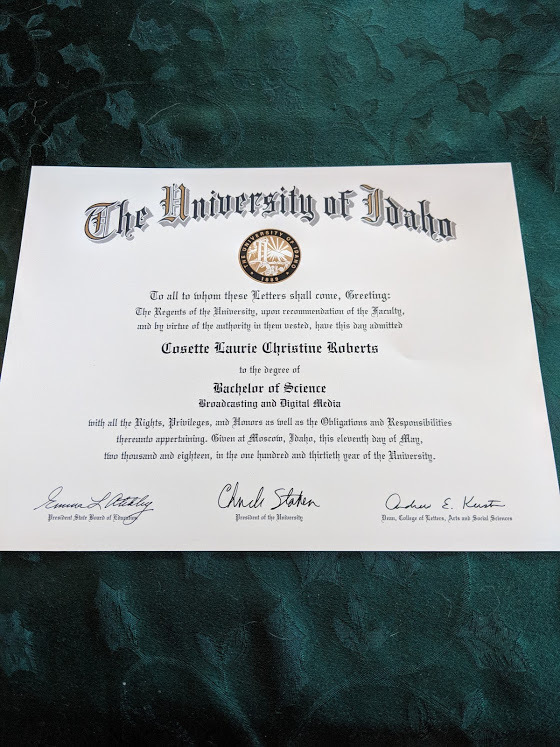 *Cosette’s diploma arrived in the mail, and now it is official!! She had earned her Bachelor of Science degree!! Woo Hoo!! So proud of her. *I felt like Mexican food, so Paul and I ordered Fajita Salads from Casa d’Oro tonight. I got steak, and Paul got shrimp. They were really good!! We both even splurged a bit and ate some of the tortilla chips and salsa that came with the order!! *My evening was spent preparing for an interview I have tomorrow with a company called VIPKids. It is an online platform where you teach children in China how to speak English. I have my interview tomorrow at 11:30 a.m. Keep me in your prayers around that time! !